My favourite console (bar none), the Mega Drive, had quite a long and relatively prolific life. Sonic the iconic, Alex Kidd with the craptacular sideburns, the RISE FROM YOUR GRAVE wonders of Altered Beast, it was all there. Which means, naturally, that retro heads will find all kinds of weirdness in its library. Among it all, you probably won’t find a cult classic as inventively nutty as Haunting. It’s creepy, it’s kooky, it’s altogether ooky, it’s totally ripping off The Addams Family. Before the lawyers swoop down and slap us in the face with The Big Ol’ Book Of Copyright Law, let’s take a look at the game. This obscure title from EA hit the console in 1993. It’s a charming, black humour-y tale of ghostly revenge, starring (as you surely noticed from the title) Polterguy. He was a punk teenager, killed in a skateboarding accident. The board was faulty, made by big business dude Vito Sardini to cut costs. Somehow learning of this after his death, Polterguy returns to haunt the Sardinis, by generally being really, really irritating. 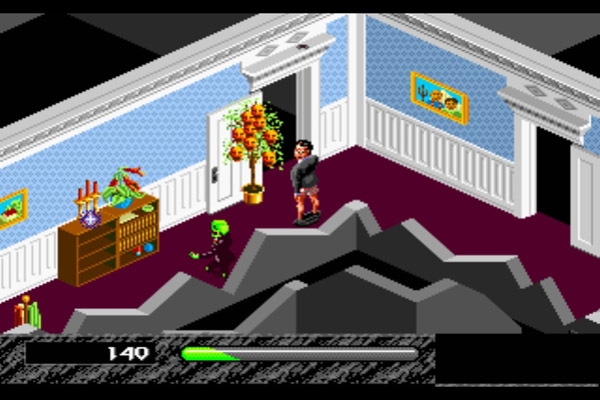 As the pesky poltergeist, you find yourself in the middle of the family home. You can cruise through the rooms at will (though you have to use doorways, which is quite sucktastic for a ghost), and each of them contains a myriad of household items to interact with. That’s interact in the sense of make a bratty little girl pee herself with. In the ghost’s hands, these items become Fright ‘ems. Everything can be used to frighten your quarry. You can possess posters to make the occupants move, or chase the Sardinis around with one of their toy aeroplanes. You can make kitchen implements fly around, like something out of Metal Gear Solid’s creepy boss battle with Psycho Mantis. All of these –and there are around 200 Fright ‘ems in total– build the family’s Fright Meter, and you finish each stage by scaring them all out of the house. There are three varieties. Some are remote controlled, like the plane. Some must be ‘occupied’ and manually sprung at the right moment. There are also those that are booby trapped, which you simply ‘set’ and watch go off when a family member approaches. You could call Haunting a lost classic. It’s quite a brief experience, but it’s an entirely unique one. As malevolent and sadistic as the premise may sound, it’s all presented with a cheeky charm. A tiny pool of blood spreading across a living room of its own accord has never been so adorable.